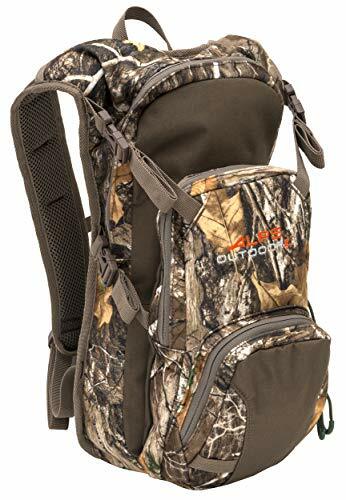 ALPS OutdoorZ #9411100 Willow Creek is the ultimate hydration pack. It comes with a three liter bladder that includes an insulated hose to keep you hydrated through the day. There’s one main pocket and two front pockets to give you 1075 cubic inches of space to haul along all of your essential gear. What’s also great about the Willow Creek is the kangaroo pocket on the front that allows you to stuff jackets or extra gear into so you can easily access it (and bring along even more gear that doesn’t always fit inside the pack). The side compression straps on the kangaroo pocket allow you to cinch the pocket tighter or loosen the pocket depending on the size of the extra gear you’re hauling. You can also lash on more gear on the front attachment points. The padded shoulder straps will ensure that the pack carries comfortably the whole trip.